Vashon has great facilities for this. Use it! Yard and Food waste can be recycled at the Vashon Transfer Station thanks to efforts by ZWV. Don’t mix your load with regular trash, the drop-offs are different and so are the fees: it’s cheaper to recycle food and yard waste. That fee is $12 for the first 320 pounds. Make sure you tell the attendant you’re bringing yard and food waste and don’t forget to cover your load. Consider getting together with neighbors and consolidating your food waste on a weekly basis if you don’t have a home composting system. This is a great option for apartment and condos. Currently food waste collection is also happening once a week at the Episcopal and Presbyterian churches and in the Gold Beach neighborhood. 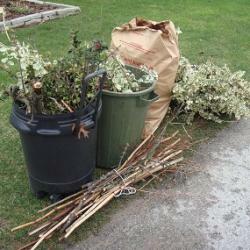 If you have not yet brought food scraps and yard waste to the transfer station, give it a try. Not only will you be acting to reduce your personal carbon footprint, you will be furthering the reuse of valuable materials instead of consigning them to a landfill. Big thanks to all the participants in this partnership between ZWV and King County Solid Waste Division (KCSWD). Of the compostable materials delivered to the collection site, yard waste outweighs food waste by far. While people are happy to participate if it’s convenient, we understand how hauling small lots of food waste to VRTS may feel inconvenient and pricey. ZWV has been partnering with multiple island churches to collect weekly batches of food waste from island households. We are researching creative ways to gather and transport this resource. If you’ve got a good idea about centralized collection, please let us know.